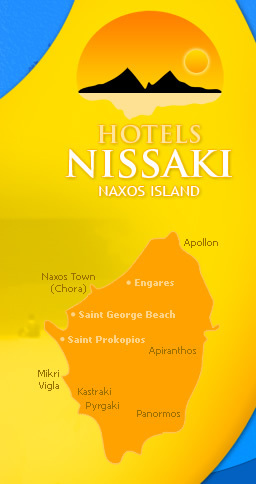 Nissaki Naxos Hotels offering accommodation in Naxos Island, our 3 lodgings are located in the unique locations of Saint George Beach, Saint Prokopios Beach and the traditional agricultural village of Engares. Our friendly staff is waiting to welcome you and offer you sheer hospitality and unforgettable holidays in Naxos Greece. Full of natural beauties, the exceptional Naxos island with its sandy coasts, deep blue waters, breathtaking landscapes and unspoiled spots will capture the heart of every visitor. Nissaki Beach hotel is a 4 stars hotel, only 10 meters from Saint George sandy beach and 200 meters from Naxos Town centre. Naxos Villa Delona maisonette villas with private swimming pools in the traditional agricultural village of Engares. Browse our pages to select your hotel in naxos.